Toms Ostrovskis began piano studies at Emils Darzins Secondary Music School, actively participating and winning prizes in several competitions and festivals in Lithuania, Estonia, France, Sweden, Hungary and Japan. He graduated Jāzeps Vītols Latvian Academy of Music in 2002 and continued his studies on full scholarship at Guildhall School of Music and Drama under Ronan O'Hora, where he obtained Master of Music in Performance Degree and an Advanced Instrumental Studies Diploma; from 2005 to 2007 he was a fellowship student and worked on his doctoral thesis, analysing advanced methods of piano teaching. During studies, Toms Ostrovskis participated in many international competitions and masterclasses in Great Britain, Holland, Portugal and France, learning from various renowned artists-teachers, such as David Dubal, Joseph Banowetz, Christopher Elton, Joan Havill, Sergey Babayan, Karl Kemmerling, John O'Conor amongst others. He has participated in Liepaja Piano Stars Festivals and has performed with the Latvian National Symphony Orchestra, Liepaja Symphony Orchestra, Bucharest Radio Orchestra, Sydcap Symphony Orchestra, St. John’s Chamber Orchestra, Guildhall Symphony Orchestra, London City University Symphony Orchestra and other collectives. He was a finalist of European Broadcasting Union Radio Competition "New Talent" (Bucharest) and Guildhall Gold Medal competition (London), 3rd prize winner in International Jazeps Vitols Piano Competition (Latvia), recipient of several annual Myra Hess Awards and winner of Yamaha - Kemble UK Scholarship Award. 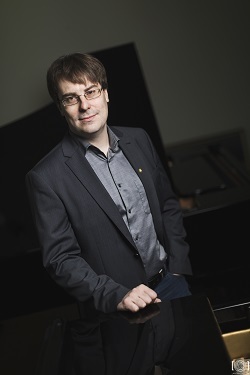 Since 2007 Toms Ostrovskis is a member of the Piano Department of Jāzeps Vītols Latvian Academy of Music. He has lead masterclasses in Latvia and abroad – in Lithuania, Estonia, Finland, Italy, Great Britain and other countries. He is an active member of “Amber Coast Artists” ensemble and on frequently participates in various solo and chamber music projects in Latvia and abroad. Toms Ostrovskis has made numerous recordings for the Latvian Radio 3 “Klasika”. Since 1998 he is a member of the Latvian Piano Teachers Association (board member since 2010), representing EPTA Latvia in festivals and conferences across Europe. In 2007 he became actively involved in the Innovative Conservatoire (ICon) project, an international collaboration to stimulate knowledge exchange, innovation and reflective practice in Conservatoires.